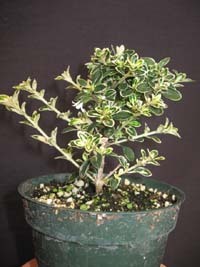 Serissa foetida 'Mt. Fuji', Variegated Snow Rose. This is just an information page. We are no longer growing this plant. Please click here to check out our website. Bonsai enthusiasts are not alone when intrigued by this diminutive tree. 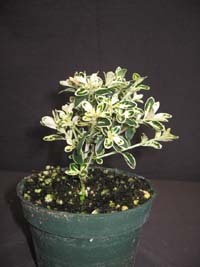 Plant lovers alike will be captivated by its shape, miniature stature, and long blooming season. The most important thing about growing Serissas is location. 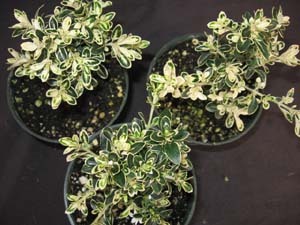 Many articles that you find on this plant will say that "Serissas can be fussy if they don't like their location." Indeed Serissas don't like sudden changes of environment and their leaves can fall but when they adjust to their new location they can grow beautifully. The best location perhaps is outside in bright shade. Even a little bit of direct sun is okay, especially when the days are cooler. Air movement is also very important. The ones outside in the shade, at least for us here in South Florida, always did much better than the ones indoors. Serissas will not withstand freezing temperatures outside during the winter and they have to be moved indoors to a location with similar conditions that they had outdoors when it gets too cold. 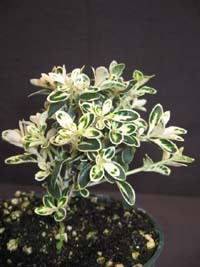 Remember to never let a Serissa dry out, and avoid wetting their leaves too much. Keep it always a little moist, but not soaked. As a fertilizer the slow release types work fine as well as the liquid types. If you want a compact plant or bonsai style, you should clip the plant every time that the branches start getting too long. Avoid trimming during the winter because you may hurt the blooming season in the spring. Perhaps, the best time to trim them is after the flowers are gone and during the hot months of the summer.